Here we are after a good day on the water. We've seen what we want, now just gotta put a spear in the fish. Today I saw one fish over 100 lbs maybe 120-140 lbs which almost gave me the shot. Otherwise we get to see the beautiful sunsets with nobody but us diving. Below is a pic of our pad. We ate in 3 nights so far and went out once for dinner. Gotta go bed now. Big day tomorrow? Let's fly Hawaiian Air. 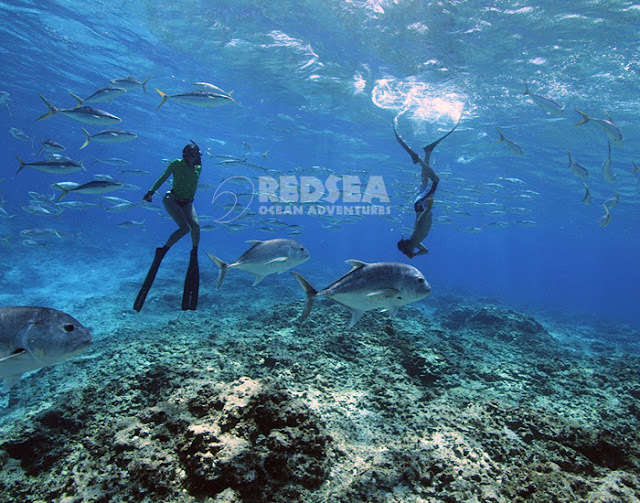 Red Sea Ocean Adventure starts now! Time to service and tune up the Red Sea boat. It's nice to be able to go fish and dive anytime but it's not free. Lot of time, energy, money, gas, and maintenance is needed every time we go out. Lucky to have a great mechanic at bayside marine who can help me with all of this as well. Now that my motors are broken in I am ready to catch fish! 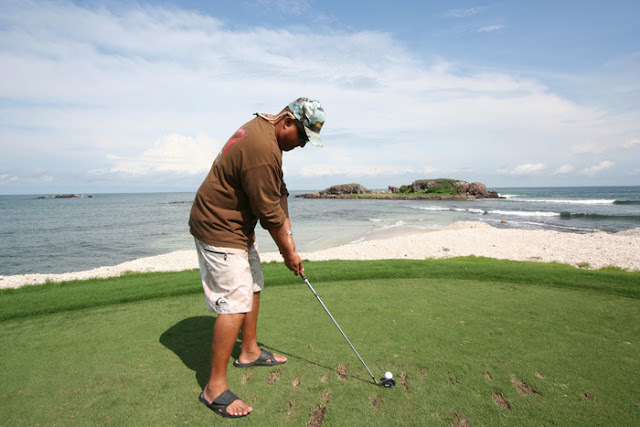 One of my favorite places to visit is Punta Mita Mexico. It's by far the most luxurious destination with 5-star living and blue water diving at its best. If you want to golf they have this crazy course and "whale of a tale" hole where you need to hit the ball across to an island then go over with a hum-vee to put it in the hole. This shot Ernie Ripley put his ball 4 feet from the hole! The blue water diving is awesome! 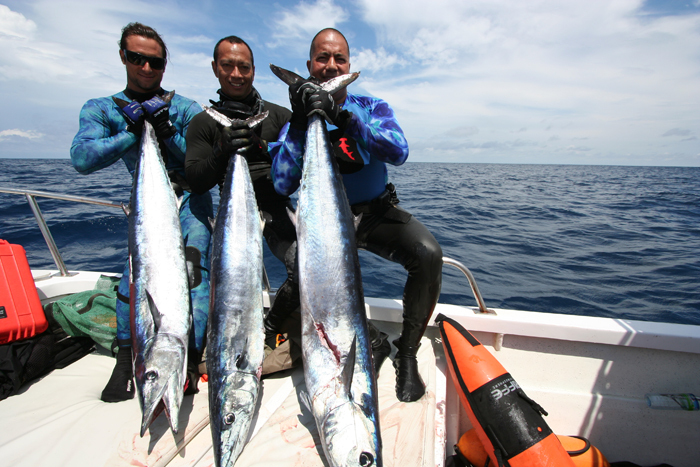 We see all kinds of pelagics and if its on we even shoot yellow fin tuna. Sebastian Melani took us out and Wendell and Ernie got to shoot these nice Onos off the rock. For the ladies, if they want to get a massage or visit the Four Season's Hotel or St. Regis Hotel they can get pampered all day long while the boys are having fun diving. 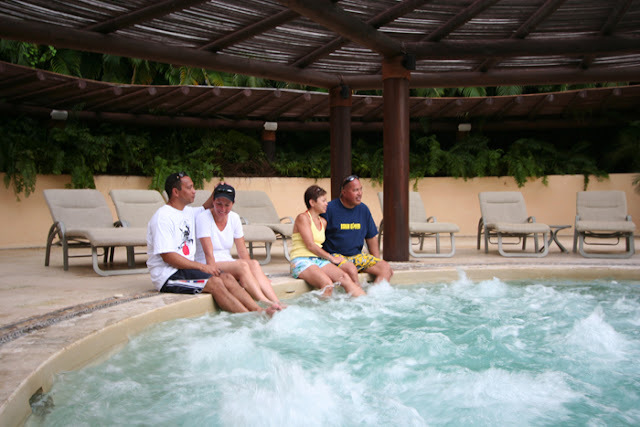 This couples retreat is by far as relaxing as it looks. 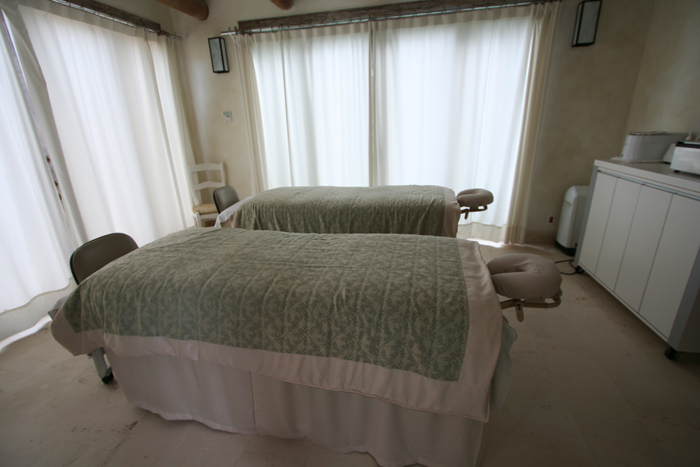 A time for some R & R with your special someone. A time to think about the future. A time to poke some BIG fish! Punta Mita here we come! I found out yesterday one of our fellow divers and friend Nicole Peters we met at the Red Sea Shootout in 2010 had passed away from a medical condition while mountain biking. She will always be remembered as a very determined person who enjoyed life. I recall at the shootout she never shot a marlin or ono before and she put in her time in the water and got both and on top of that shot 2 goats while hiking the mountains of cerralvo island in between dives. I'm sure her many friends and family have more great stories and memories to share but for now please pray for her Ohana. Remember I mentioned Intova was coming out with a new camera like the GoPro. Well it's on the market and comes with the wide angle lens and LCD screen. I'm looking forward to getting some sick shots with this camera on my next trip! Mahalos Joe for always supporting Red Sea! This weekend we checked out the maui sporting goods fall shootout and it was a great event. lots of friends and divers came out to participate. Kurt Taguma worked hard and we were stoked to be able to help sponsors the event. 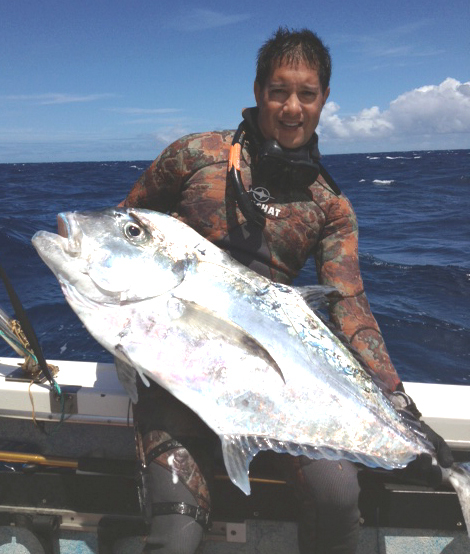 Terrence Takahata, Sonny Tanabe, and Frank Farm are the legends of spearfishing in Hawaii. They have done so much to promote the sport and we are so proud to have mentors like this to follow in their footsteps. This years Hawaii's Wall of Fame divers were honoring Lance Otsubo, Jason Hijirida, and Travis Kashiwa for their contribution to the sport. They represented the USA in portugal and continue to help new divers excel their diving skills to new levels. Congratulations guys and Mahalo to Maui Sporting Goods for hosting this years event. 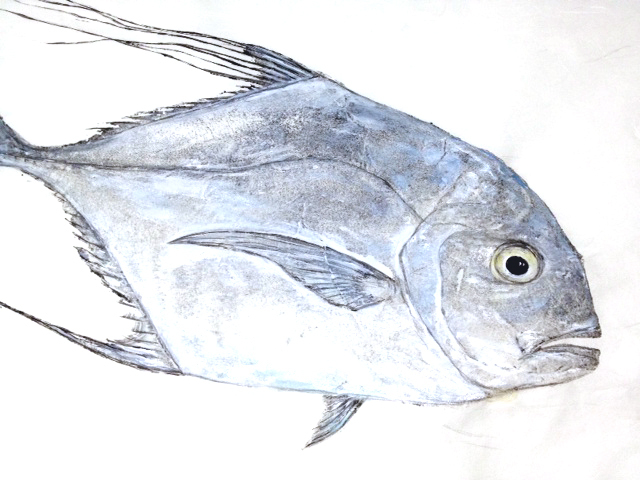 Past few days my dad has been busy working on painting Gyotaku of a Kagami caught by some fisherman on our trip to Mexico. It was really nice and the details put in brought the fish back to life. The streamers on the dorsal fins are longer when the fish are smaller and as they get older the streamers disappear. Then today, my friend Puna Apio calls me up and asks if we want to print another one? Wow this one is bigger but I think the boys on the boat want to eat sashimi tonight while its still fresh. Good job Puna! I'll be waiting for my slab:) ha ha! Hope everyone had a nice Labor day holiday off relaxing. I sure did! Catching up, cleaning up, and gearing up for our next Red Sea Ocean Adventure. We've been getting lots of positive comments about our last HSD show in the Northwestern Hawaiian Islands so we decided to air part 2 featuring Maro reef and Pearl and Hermes Atoll. This was the most wildest place we visited with all kinds of fish in relatively shallow water. We also seen the most gray snapper, "uku" in dive ever! You don't want to miss this show, airing tonight Tues. Sept 4, at 8:30 pm on channel 12 or 1012 or via the web at www.oc16.tv. Tune in and thanks again for watching!